We moved into Saint Germain a year ago on the 3rd June 2017. It means we've lived here long enough to see the progress of all the seasons through our north facing glass walls looking towards Mt Ainslie. This past Autumn would rate as our favourite season so far ….. I took this pic from our window at the beginning of April when the first dusting of Autumn colours on the parkland trees started to emerge. 3 weeks later it looked like this ……. A month ago it looked like this - Autumn colour at its absolute exhilarating peak. A week ago sunrise was looking like this ……. winter has arrived! 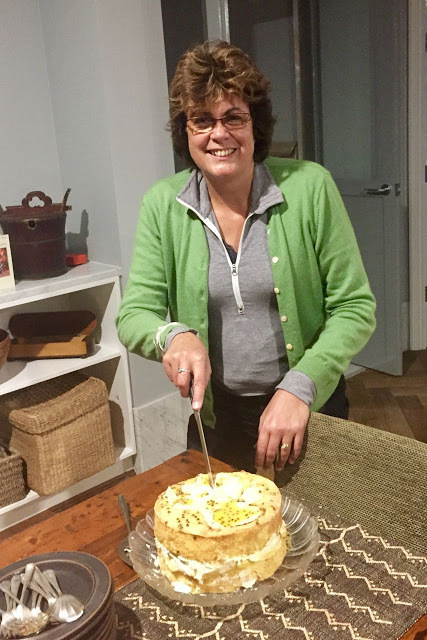 Reminding us that a year ago Judy made us another spectacular cake to celebrate our move into the apartment ….. Hopefully this can become an annual tradition Judy ?? And we have made a bit more progress with the winter garden, after spending a year experimenting with the kinds of plants that will tolerate our regular absences OS and in Sydney, and the "glasshouse" conditions (succulents and semi-tropicals are good). It's a great place to sit in the sun on a Winter's day admiring the views and the birdlife enjoying those parkland trees ……..
We've had the Coogee flat rented for a month now and we're just starting to ease into a more Canberra based life after an intense month of packing cleaning sorting and unpacking (again). We've never regretted any aspect of this move to apartment life despite minor regrets mostly to do with not having our own garden any more. Lucky there is such a beautiful natural environment surrounding us to fulfill our attachment to plants and earth.